Should I sell my gold ? Perhaps you have some unwanted jewelry that you don't wear anymore in a box in the closet.At today's price of $1,279 an ounce gold has fallen -18% over the last year. Should you sell your gold now or wait? Below we summarize the principal arguments for and against selling your gold now. Compared to other metals gold is expensive. 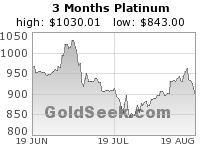 At $1,279 an ounce gold is more expensive than platinum which is $902 an ounce. Platinum is about 15 times rarer than gold and historically has been much more expensive.Compared to rhodium gold is even more overpriced. Rhodium is currently $2,750 an ounce. Rhodium has historically been as much as ten times as expensive as gold. The price of a man's suit. A popular metric for valuing gold is the price of a man's suit. Ever since Biblical times, a high quality man's suit has cost about 1 ounce of gold. Today, you can buy a man's suit for as little as $99 which would make gold 13 times overpriced. Another popular metric is the price of 300 loafs of bread which historically have cost 1 ounce of gold. Admittedly loaves of bread were much larger than today, but even so gold would seem expensive. Gold has been rising 11 years in a row. Its very rare for any asset to keeping rising continuously for this length of time. The primary factors driving the rise in the gold price over the last decade are still in place. The gold price should continue rising. Gold is cheap relative to the monetary base. Gold should be about $10,000/ounce if you divide the monetary base by the gold reserves (8133.5 tonnes). This is how gold has been priced in the past. The trend is your friend. One popular method used by traders for predicting future trends is the moving average. If the price is above the moving average then this indicates an upward trend.The gold price is currently above both the 200 day moving average of 0 and the 50 day moving average of 0. This indicates a strong uptrend so the gold price may rise further. The average forecast given by the London Bullion Market for 2013 is $1,753. This forecast has been quite accurate for the past few years. A study by Standard Chartered Bank based on a study of falling mine production predicts prices of $2,107 an ounce in 2014 and $4,869 in nominal terms by 2020. When real interest rate become greater than 2%. Inflation is currently 100% and short-term interest rates are N/A%, so real interest rates are -100%. When the Dow/Gold ratio returns to a value of around 5.5. The Dow is currently 23,433 so the ratio is now 18. For the ratio to return to 5.5 gold would have to rise to $4,260/ounce (at the current level of the Dow). When the gold-oil ratio reaches 20 barrels/ounce. With oil at $107/barrel the ratio is currently 12. The gold oil ratio has exceeded 20 in the past but rarely remains at this level for long. Sell when the price falls 10% below the 25 day moving average. Applied to the prices since 1979 this seems to give the optimum stop loss.The 25 day moving average is currently 1,288. Gold seems to reach cyclical peaks every 22 months. The last peak was in August/September of this year so it is possible that it will reach another peak in June 2013. Gold performs best when the yield curve is under 1%. It performs worst when the yield curve is between 1-2%. Gold will probably never fall below the cost of mining it which is currently about $500/ounce. If gold fell below this price the gold mining companies would go bankrupt so there would be no more supply. According to the Talmud you should keep one-third of your assets each in land, 'business interests', and gold. This idea has a modern equivalent in the Permanent Portfolio theory which prescribes a mix of 25% each of Treasury bills, long bonds, stocks and gold. Most pension funds invest only in equities and bonds, with small allocations to property and cash. However, in recent years concerns have grown over the risks inherent in these asset classes, leading to increased interest in gold. Historically the gold/silver ratio has been about 16:1. 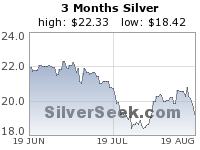 It is now over 30:1 which leads many analysts to conclude that silver is undervalued. However the 16:1 ratio was based on Western valuations and many Asians, especially the Chinese, are much more interested in gold than silver so there is reason to think that the price ratio may be redundant.